Home / Unlabelled / Government and destinies of NOUN law graduates. 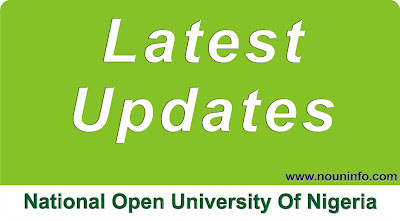 The imbroglio between the Council of Legal Education (CLE) and National Open University of Nigeria (NOUN) over admission into the Nigerian Law School is indeed discreditable albeit resolvable. Taking a realistic and holistic look on the issues, the quagmires which have lingered for 5 years since the first set graduated resulted from conflict of interests between the Federal Ministry of Education and its counterpart, Ministry of Justice. Regrettably, innocent law graduates became the proverbial helpless grass that suffers the fight of the elephants.By their establishments, NOUN and National Universities Commission (NUC) operate under the Ministry of Education while the Nigerian Law School, under Council of Legal Education is supervised by the Minister of Justice/Attorney General of the Federation; thus two different ministries involved. The two ministers have significant roles to play in the resolution of the conflicts as their continual disagreement will keep the students roaming the streets. These two ministers should harmonize their differences without further delays. Possibly, President Muhammadu Buhari should summon them for amicable resolution of the crisis pursuant to national security and interests. Interestingly, this is an era the polity is overheated over national security. Irrefutably, NOUN law graduates crisis aptly falls under matters that deserve doctrine of necessity and national security as keeping grown persons to be wandering the streets without vocational training for their practice and engagement is highly prejudiced and dangerous. No doubt, the predicament commenced during the previous administration but in line with change mantra, the crisis deserves a state of emergency as unrelenting neglect is precarious. The Minister of Justice, Mr. Abubakar Malami (SAN) certainly understood the undefeatable title the students acquired as Innocent third parties in line with Lord Denning’s‘bona fide purchasers of Interest for value without notice of defect’ though not the case as they school was accredited. At most, if the accreditation appears questionable or flawed, the appropriate thing should be to withdraw the accreditation as NUC did to University of Abuja and recently, Obafemi Awolowo University. The powers vested in the Minister of Justice/Attorney General of the Federation to give directions to the Council of Legal Education should be effectively utilized forthwith. Enough of empty promises and tactics as destinies are being shattered. If the numerous prominent legal icons that embraced ODL (Open and Distance Learning) were frustrated during their time, the nations would have lost all their contributions to the legal profession and society at large so far. To sum, the Minister of Justice should urgently release these innocent citizens from incarceration. No country of the world would allow such shameful treatment to triumph especially in a government that made uncountable promises to the citizenry. A hullabaloo on national security when citizens’ sweats are aimlessly endangered is inconsistent; and akin to a menagerie. The FGN under President Buhari has the brightest chance of redeeming this situation and write his name in gold. These law graduates should not continue in dirges while the government is chorusing national security and interests everywhere. Their continued denial of admission quota into the Nigerian Law School is the height of wickedness. It is imperative to recall that admission into the law school doesn’t guarantee successful exit. If there is nothing hidden, let these law graduates be admitted into the law school like their counterparts from other universities. They studied and graduated. Allow them to prove themselves. Thus, live and let live.